Printable one-side only, this is a bright white 14 mil opaque Teslin label material with a super permanent adhesive. 102610 Teslin was designed for laser and digital press printable, self adhesive nameplates and self-adhesive signs. 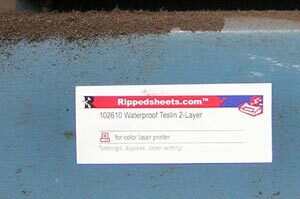 Teslin is approved as an advanced material for Xerox® laser printers and HP® Indigo® digital presses. It prints well in all mid and higher priced laser printers, including HP laser printers in the Tough Paper mode. Also, 102610 works in many smaller low power and low cost laser printers with testing. This can be applied with a minimum application temperature of 50°F and a service range -40°F to 250°F.